It’s Monday morning here in the anchorage at La Cruz, and one of the things one does in La Cruz is try to keep the frigate birds from landing on the masthead wind speed/point indicator and on the windex; the birds are heavy and have a history of breaking the gear when they land on it. The birds are also quite fearless of heights and waving gear beneath their feet – I imagine they are accustomed to crash-landing into tree branches waving in the breeze, and a wiggly masthead with small rotating, weaving, and bobbing gear doesn’t present much of a challenge to them. Either way, when they do the landing thing they apply their weight to the gear and can snap off the wands, break the cups, and mess up the bearings. Expensive, and difficult to replace here. To combat the birds people have put up brooms, rakes, and tied string around the masthead to deter the birds. I’ve made up a pig-stick with a flag on top, hoisted to the masthead – which presents a problem for the birds as the stick reduces available landing area and the flag is a visual annoyance. The life of a frigate birds seems to involve spending a lot of time hangout at the corner drugstore and waiting for some other bird to pick up something useful out of the water, and then dive bomb the other bird in hopes it will drop the food so the frigate can swoop in and recover the food mid-air. At least a couple of the frigates prefer to hang out on mastheads rather than hover in the air like everyone else. So far my flag has worked. I got the engine oil and transmission fluid and filters changed,yesterday and stopped by the boat yard to drop off the used oil for recycling. Beetle’s floor boards look a little nicer as they are now washed, and I made a minor running repair to the dinghy floor boards – the rubber end caps on the aluminum rollup floor have a single rivet holding them in place, and two of the end caps came off, which presents a sharpish metal edge to the rubber fabric (not good). I ran in two holes each for the rubber end caps, and put in a pair of aluminum rivets each to hold the end caps in place. So far that is working fine. Today’s ‘job’ is to get to the larger market (Mega) and pick up provisions for the run over to San Jose Del Cabo, 288 miles to the NW from La Cruz. 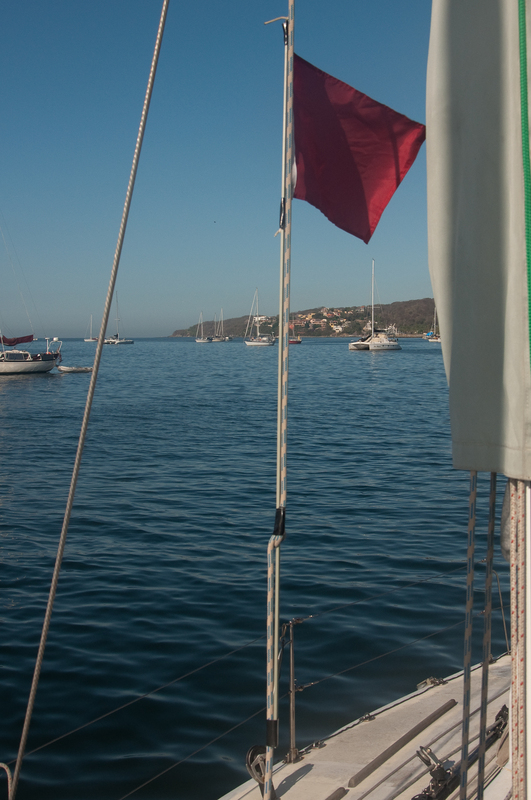 The weather forecast is looking good for a Wednesday morning departure from La Cruz and a planned Friday afternoon arrival at the southern tip of Baja (which is oddly referenced as ‘The Baja’ round these parts). I’m hoping there will be enough wind to sail some of that distance, which would be nice. Lindi is flying in on Saturday to join Beetle for the big loop up to Puget Sound/Seattle that we will be taking off on right around the first of April, and I need to be set up to meet her at the marina in Cabo. 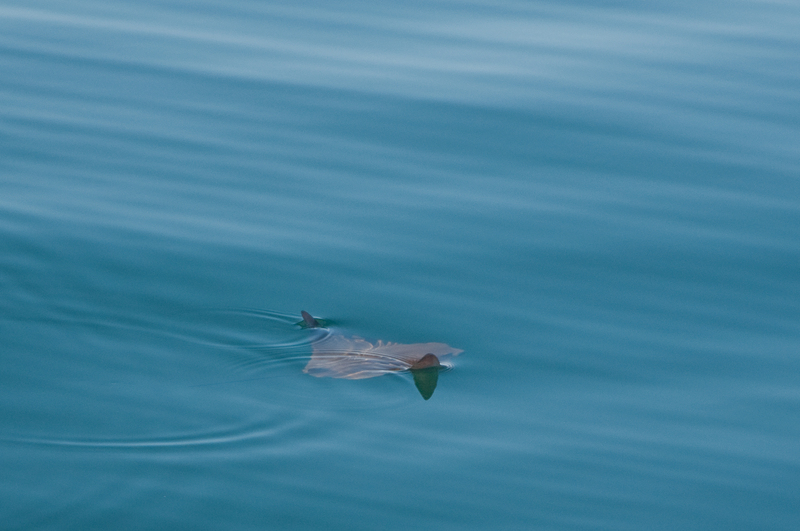 The little bat ray friends swim around super slowly through the anchorage, these fellows are about 14″ across wingtip to wingtip. Sometimes they travel singly, sometimes in small groups of 4-8 rays. The tiny fin-tips pop up above the surface on each stroke and the first thought when you see one coming is ‘two small sharks!’ and then they get closer and you can see their brown diamond-shape. This guy cruised by Beetle this morning when I had the camera ready. You want your masthead to look like this, devoid of frigate birds. The flag is up on the pig-stick secured to the starboard spinnaker halyard run as a loop (the halyard tail is tied to the snapshackle where the sail normally attaches), hoisted until it two-blocks, and then crank down on each side of the halyard to keep the stick (in this case a spare mainsail batten) standing vertically. Also a really good use for the red protest flag. 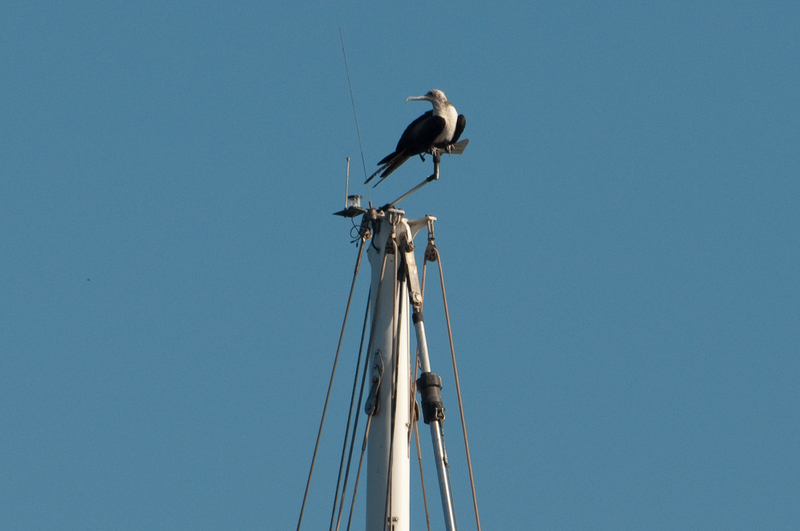 This is what you do not want to see – big frigate bird hanging out at the masthead (this is a neighbor’s boat), standing on the wind speed/point wand. This bird is actually standing not on the wand, but even worse(!) – on the little air paddle that rotates to give wind point (direction). Bad bird! The pig-stick as assembled on deck. I’ve got some gorilla tape wrapped around the batten to hold the flag in place, the halyard is looped at the mid-point of the batten and again at the bottom of the batten – loops held in place with more gorilla tape. 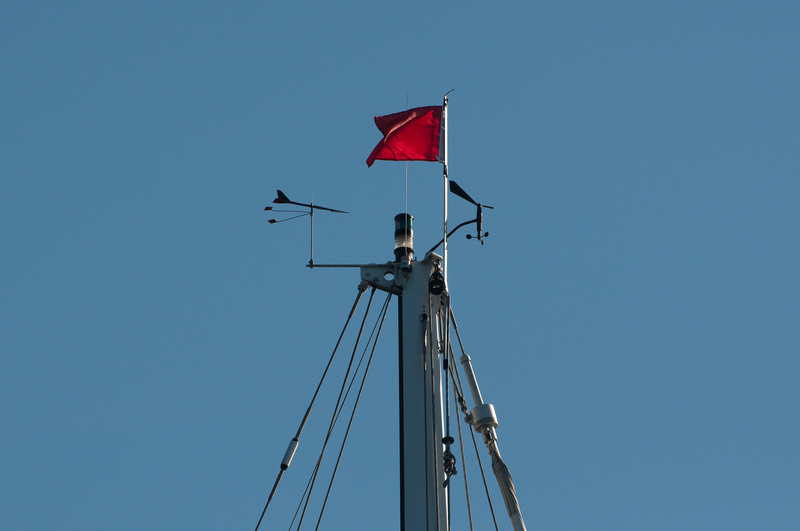 Hoist it up, apply tension to keep the batten vertical, and the flag protrudes up above the masthead and flaps away in the breeze. If there’s breeze but some rolling going on, the flag continues to flap with roll. At least one frigate bird came by to inspect the flag (gave it a quick nibble) but did not attempt to land. Good frigate bird. And this is the non-OSHA approved method for staying dry in your RIB dinghy while running through the anchorage. Stand with legs wide apart, hold onto the painter in one hand, the dinghy throttle in the other. 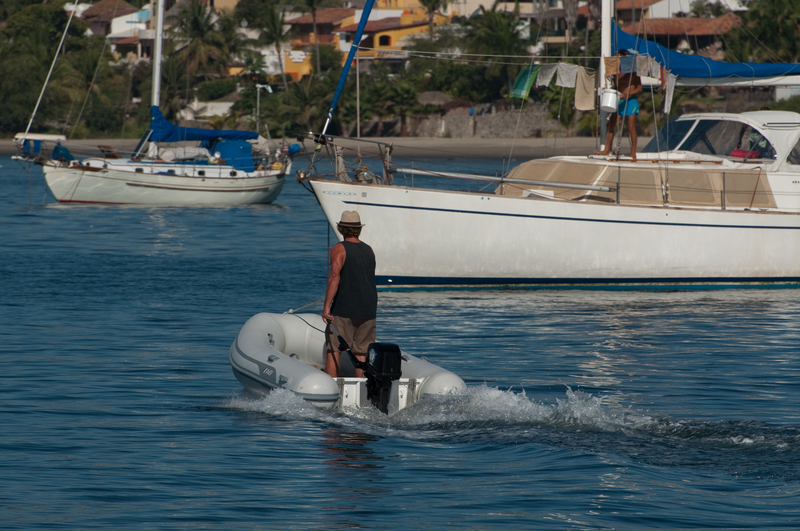 Note that this fellow is NOT using the little red-corded kill switch on the motor – if he falls out of the dinghy that outboard will continue to run and the dinghy will zoom around the anchorage until it flips, runs out of gas, runs into the shore, or somebody else catches it. You, as the recent operator only now treading water, have to hope the dinghy won’t come back in your direction while you’re still in the water. This happened recently to a dinghy operator in La Paz and the good samaritan that went to help and retrieved the person in the water, was himself run over (twice!) by the high-speed larger dinghy that was careening around the anchorage with the engine running at high speed and nobody aboard. The injury was severe, resulting in medevac to San Diego and loss of lower part of the leg. So use the kill cords.